The Russian energy giant is in talks to purchase oil fields in Brazil and plans to start production at gas fields in Bolivia. Gazprom International, a subsidiary of Russian oil and gas giant Gazprom, plans to expand its presence in South America. According to Reuters, the decision was announced by Shakarbek Osmonov, the director of Gazprom Brazil. Osmonov stated that the company is in talks to buy stakes in Brazilian offshore fields and plans to start production at gas fields in Bolivia in a year. In particular, the company is interested in a Brazilian field where exploration is underway; however, the precise identity of the field remains unknown. The company will start gas production in Bolivia in 2016. “Latin America is rich in hydrocarbons, which interests Gazprom. Gazprom International, a subsidiary engaged in international projects, will undertake gas production,” said Ivan Kapitonov, deputy head of the department for state economic regulation at the Russian Academy of the National Economy and Public Administration. French company Total is a key partner for Gazprom in Bolivia. According to Investkafe analyst Gregory Birg, in 2008 Gazprom, Total, and Bolivian state YPFB signed a service contract for exploration and production at Bolivia’s Acero field, which has reserves estimated at 51 billion cubic meters (bcm) of gas, with $1 billion to be invested. In addition, there are two other fields that have been explored, with around 176 bcm of gas and 15 million tons of condensate. Gazprom is a minority shareholder, with a 20 percent stake in these fields, while Argentine-Italian Tecpetrol holds another 20 percent and Total owns 60 percent. “At a time when the world’s hydrocarbon reserves are being depleted, almost every company is seeking to increase their reserves in one way or another, in order to continue activities in the future,” said Dmitry Baranov from investment holding firm Finam Management. According to Baranov, the Latin American countries have gambled on speeding up development, which means that in the coming years they will need a lot more oil and gas. “Cooperation with Latin American countries will strengthen political and economic relations with Russia and increase the level of trust in relationships. In addition, Russian companies will be able to replicate their experience there in other regions of the world,” he added. According to Gazprom’s press service, Latin America is a promising region for the company. 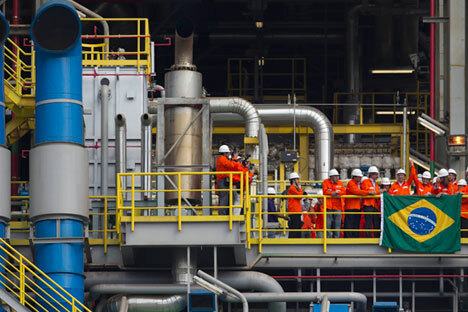 In February 2007, the company signed an agreement with Brazil’s Petrobras to cooperate in hydrocarbon exploration, production, transportation, and marketing. Of principal significance was the development of offshore fields, but the production of liquefied natural gas is included in Gazprom’s planning. Gazprom is also developing similar projects in Venezuela. In September 2008, Russia’s gas giant and local company PDVSA signed a memorandum of understanding on the Blanquilla Este y Tortuga project, which entails exploration and the production of natural gas offshore on the Venezuelan shelf, supply to the domestic market, liquefaction, and export. However, with the sanctions imposed on Russia by the United States and the European Union, experts believe that Gazprom’s cooperation with Brazil has taken on new meaning. “Widening cooperation between Russia and the BRICS countries amid increasing sanctions is a logical, sequential process. Up until the Ukrainian crisis and the ensuing policy of confrontation by Western countries, Russia had given preference to Western companies over the BRICS,” Kapitonov said. However, he added that sanctions banning exports of certain types of oil and gas equipment to Russia have given new impetus to projects in Russia and the BRICS countries that may have been planned long ago but had yet to start for a variety of reasons.